Soap Opera Kids: Who Plays Reed Hellstrom On Y&R? Meet Tristan Lake Leabu! “The Young the Restless” Tristan Lake Leabu, who plays the part of Reed Hellstrom, has been a mainstay on the show for the last several months with his role really starting to blossom and take shape. So we would like to help you get to know more about the guy behind the part. Tristan Lake Leabu was born on August 19, 1999 and was raised in Los Angeles, California. He got an early start on his business career, making the decision to be a performer at the age of five. His parents also work in the biz so they were very happy and supportive of his decision. In 2006 Tristan Lake Leabu landed his first major role as Jason White in “Superman Returns.” You may also remember seeing Leabu in an episode of “Hawaii Five-O,” or on the lifetime movie “While the Children Sleep.” That’s just naming a few things he has played a part in. 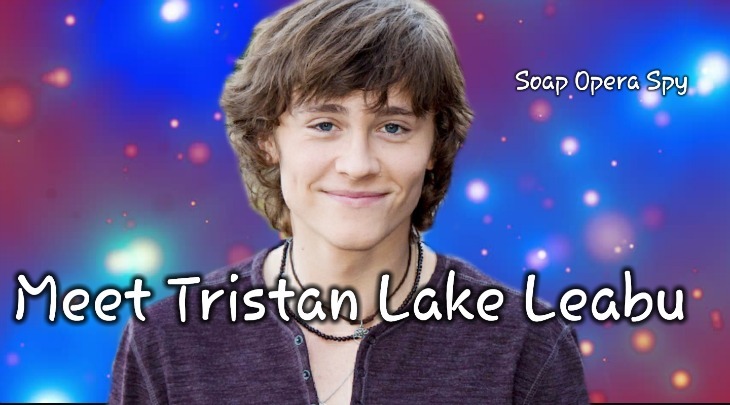 Tristan Lake Leabu joined the cast of “The Young and the Restless” in December of 2016 when the character of Reed Hellstrom was SORAS (Soap Opera Rapid Aging Syndrome). Tristan has done an awesome job at portraying the part and his character is getting a lot more screen time as we go into the summer. The writers hope to draw more teens into the show while they are out of school so we have been seeing a lot of them on Y&R now. Recently the writers decided to age the Ashby teens as well and we can already tell that Mattie Ashby (Lexi Stevenson) may be a love interest for Reed Hellstrom. Tristan is also a very talented musician and we have gotten to see a lot of that on Y&R with Reed Hellstrom’s performances. He plays guitar, piano and drums and not to mention he has an awesome voice! He really has you drawn in when he sings! So make sure to stay tuned to CBS’s “The Young and the Restless” to see Tristan in action! Woman Crush Wednesday: Check Out Y&R Star Sharon Case’s Hot Pics!